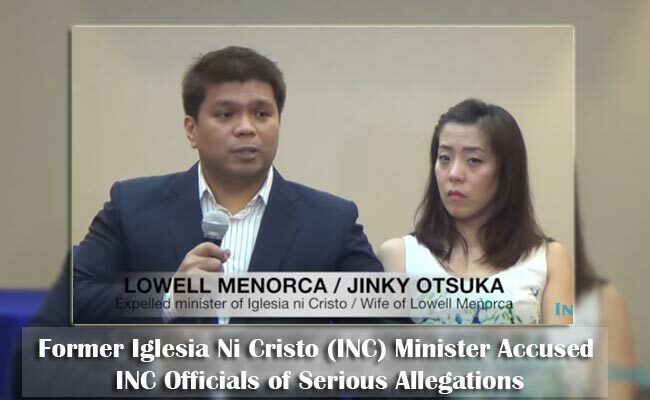 Former Iglesia Ni Cristo (INC) minister Lowell Menorca II openly claimed that he was kidnapped by armed men in Bulan, Sorgoson province and was kept in a jail in Dasmariñas City. Menorca accused the higher Iglesia Ni Cristo officials as the mastermind of his kidnapping and attempted murder. This is due to the speculations that Menorca could be the mysterious blogger who exposes the alleged corruption and other hidden issues in the INC. According to Menorca, there are other people who are being suspected to be the anonymous blogger and they are being held against their will. Menorca revealed what happened during his captivity and why he denied being held captive at first. He faces the media with his wife and Atty. Trixie Angeles. Patricia Ann T. Prodigalidad, the legal counsel of the INC officials said in a statement that they are willing to face the allegations of Menorca though they as saddened by what Menorca is accusing them of. Furthermore, Prodigalidad said that they are expecting fair and due process to cleat the names of her client. Menorca also revealed that his kidnapping was done by police officers of Quezon City. According to him, the police tried to kill him by throwing a grenade in the car where he was forced to stay. Fortunately, the grenade did not explode and he was able to escape though he passenger door, however he was held captive again as the kidnappers went back to check why there was no explosion. The police officer took pity on him and took him in the jail and just charged him wth illegal possession of explosive. Soon the case was dismissed and he was forced to be transferred in the INC complex in Quezon City in October. He was then also forced to claim that he was not held against his will. Menorca signed the waiver that sets the innocence of the religious sect officials but he claimed that he signed it as his family are also held and their lives were threatened. However, due to his allegations against the official of INC, Menorca fears that the members will once again hols a rally more hostile than the last one that was held in EDSA and disturbed thousands of motorists.